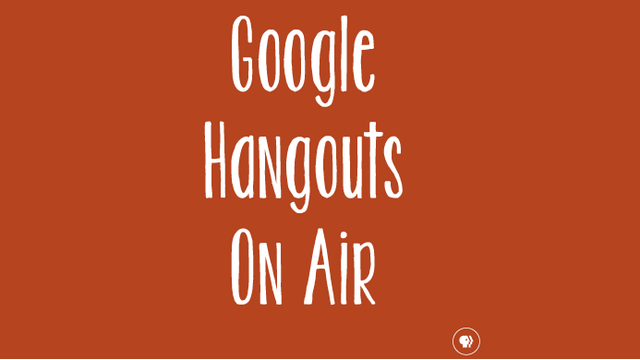 Host Your Own "Google Hangouts On Air"
Thinking about using Google Hangouts On Air? According to Google itself, "with Hangouts On Air, you can broadcast live discussions and performances to the world through your Google+ Home page and YouTube channel. You can also edit and share a copy of the broadcast." It’s always exciting to try a new tool. 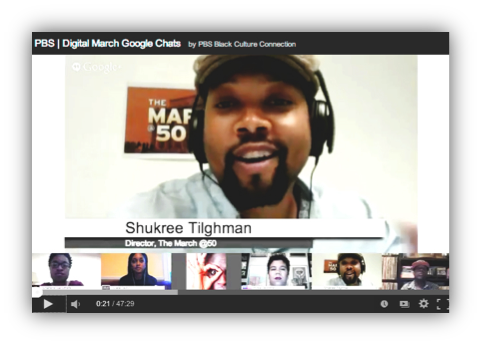 PBS Black Culture Connection jumped at the opportunity to test Google Hangouts On Air this summer to bring people together around the 50th Anniversary of the March on Washington (MOW) through the PBS Digital March! 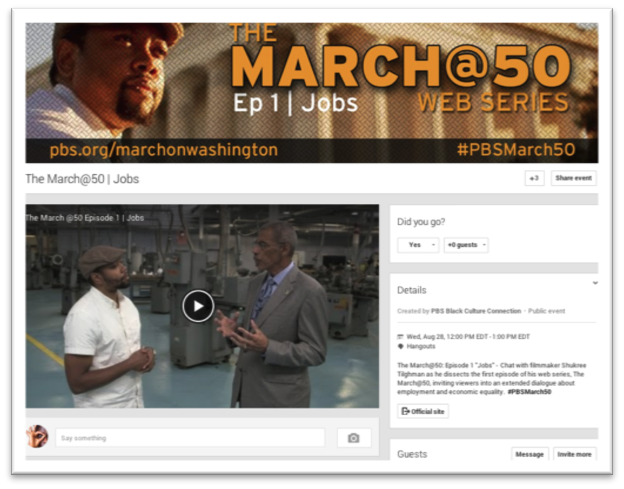 The PBS Digital March was envisioned as a collection of online screenings and live events, bringing together all elements of the MOW initiative – including The March Documentary, The March@50 web series, and local Memories of the March stories. We wanted to give visitors the opportunity to engage in meaningful conversations about the 1963 March, its key issues, and the people who were there! We worked hand in hand with Google Representatives and at the Google Office in Washington, DC to host four Google Hangouts on August 28th - the 50th Anniversary of the March on Washington - and an additional four Hangouts throughout the month of September. Combined, these hangouts fostered new partnerships with over a dozen community organizations, making for incredibly lively discussions that have become a new evergreen resource within the March on Washington Collection. Be prepared for anything! And I do mean anything. This includes freeze frames, a dropped Internet connection, and perhaps an accidental slip of the tongue from a guest panelist. It happens. Anything is fair game with LIVE streaming, so be prepared to roll with the punches. The Cameraman App will allow you to control your Hangout On Air (HOA) like a technical director, moving back and forth between your guest participants and controlling who is visible/ audible. You’ll also find that the event chat window is very helpful for keeping your panelists in the loop if any changes need to happen while the HOA is taking place without interrupting the conversation (e.g., signaling a panelist that you’re coming to them next with a question). So in the spirit of LIVE TV, keep it moving. Don’t be afraid to make light of a blooper, switch things up and move to the next topic or camera view. And if push comes to shove… you can always edit the video recording post event with YouTube’s video editor. (NOTE: Your Live HOA is posted to your Google+ Homepage and YouTube Channel). This post is the first in a three-part series to equip you with all the skills you need to host your own successful Google Hangouts On Air. Stay tuned for part two, coming next week. Nik Eley-Carr is Manager of Digital Content and Strategy at PBS in Washington, DC. Nik manages the PBS Black Culture Connection site and hosted 8 Google Hangouts On Air as part of the 50th Anniversary of the March on Washington last fall.